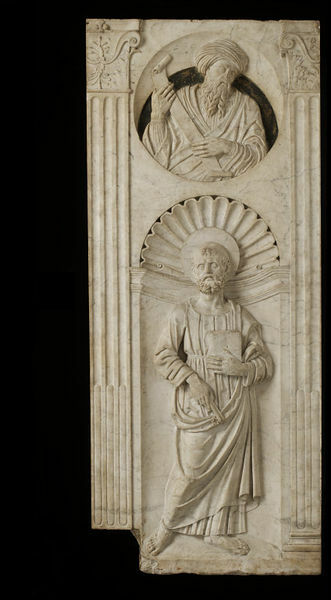 This relief would once have formed a section of a multi-part altarpiece, and would most likely have appeared on the right hand side, and joined onto, the central panel. 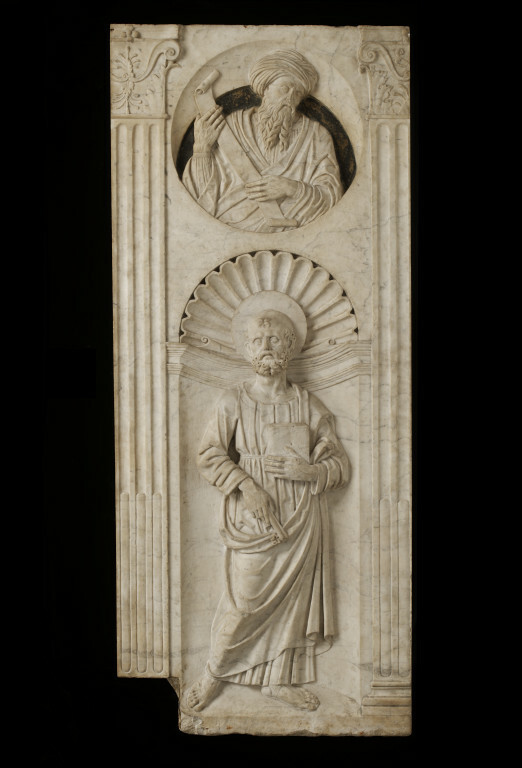 The companion piece (7390-1861) would have been next to this relief and furthest away from the central panel, because St Peter is always depicted on the right hand of Christ. Marble, carved in high relief. Full length figure of St Peter in a niche, wearing a robe and cloak and holding a book in his left hand and the keys in his right hand. Above is a circular medallion, enclosing a half figure of a prophet holding a scroll with both hands and looking down. On the right and left are two incomplete pilasters. This and the accompanying piece (7390-1861) were purchased from a marble-mason in Naples in 1860. They had been found a few years previously, placed with their carved surfaces downwards, forming some of the pavement of the Jesuit's church in Naples. Historical significance: St Peter is the leader of the Apostles. He is depicted here with his usual attributes of the key to the Kingdom of Heaven, and the gospel. The saints represented at the top of the Gateway of the Castelnuovo in Naples are shown within very similar niches, with the semi-circular shell-like carving behind each head, and this seems to be a frequently used motif at this time. The prophets in the circular medallions above are a common motif in Naples and can be seen in the Placido di Sangro monument in San Domenico in Naples (1480). This relief is believed to have formed part of a pentaptych, and may have once have adjoined the (proper) right side of 7390-1861, the (proper) left side of which would have adjoined the central panel. The pilaster on the (proper) left of 7390-1861 is different from the other three pilasters, which suggests it could have once adjoined the central panel. St Peter is usually depicted in the prime position at the right hand of Christ, however because of the missing edges to both these pieces it is difficult to be definite about their original form.